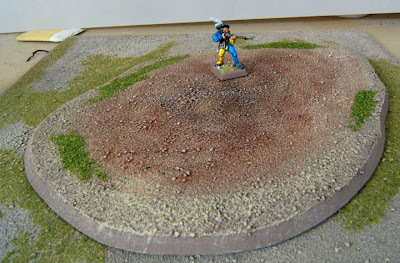 Two more WFB "magic" terrain pieces. Both are from the Marsh category. This is my Earthblood Mere though I think I will use it as the Mist Wreathed Swamp as well. I had wanted to put reeds and other flora around the edges, but then it becomes a bit of a hassle for gameplay. So I left it flat for ease of moving formed units over it. I also wanted it to look less like a real swamp (this is magic terrain, after all) hence the colorful green. Next is the Khmerian Quicksand. 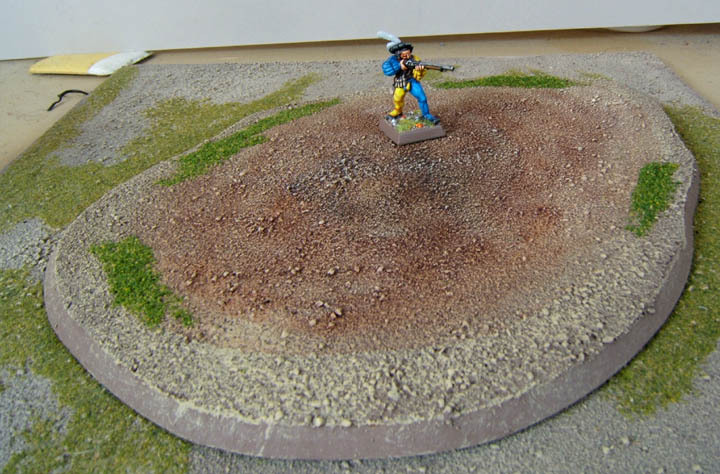 My terrain and my armies are not desert themed, so I didn't want to do something that looked out of place. So I tried something a little more muddy. As with most of the other terrain pieces, I'm trying to keep it simple and quick. I'm saving the big investment of time for some of the more involved pieces -- like the buildings. 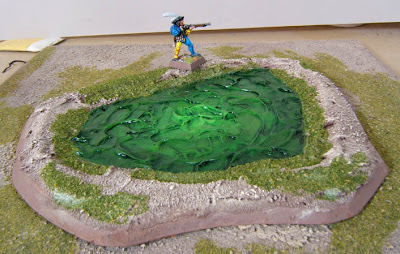 All of these posts about WHFB terrain beg the question though, where are the standard woods, hills, and other basic terrain? Does 8th not have anything... normal? You've been pretty busy with the terrain I see. Nice. In the new world of Warhammer, 5 out of every 6 hills, 5 of 6 woods, and 3 of 3 marshes are enchanted. So are most fences/walls, buildings, and any sort of monument. "Normal" terrain is in the minority. It adds to the randomness of the game. At first I didn't like it. Now I've gotten used to it as a game element. It's like a video game, where you pass one "level" and go on to a new one where there are all sorts of surprises. So now we end up with things like hordes of 50 skavenslaves that suddenly find themselves with Weapon Skill and Initiative 10, frenzied and hating all opponents and able to take on elite troops, all due to abilities granted by magic terrain.